This correspondence, which centers around Joab Spencer, concerns the location of the Shawnee Mission near Kansas City, Kansas. 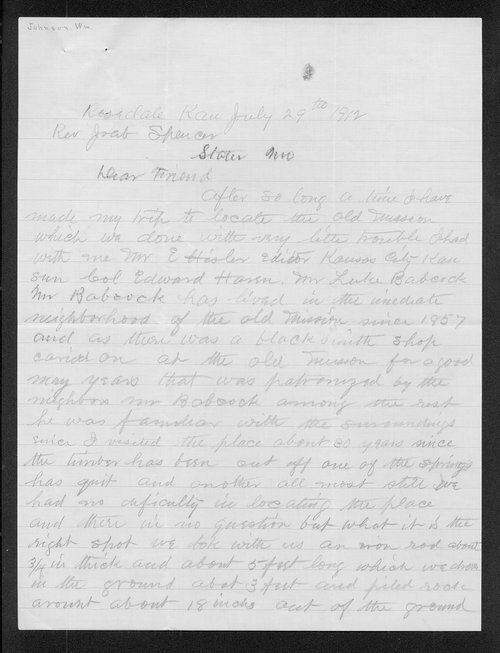 In the first letter, dated July 29, 1912, William Johnson asks Spencer to clarify some details regarding Johnson's father, William Johnson. The remaining letters deal with the same subject, and elaborate further on the location and background of the Shawnee Methodist Mission that was founded in 1829. People - Notable Kansans - Morgan, Pearl W.